Designs by Vivienne Westwood, Jean Paul Gaultier and Rei Kawakubo feature in this fashion exhibition at the Museum of Fine Arts, Boston, which aims to explore and question assumptions about gender-specific clothing. The show, titled Gender Bending Fashion, presents clothing over the past century that has "challenged rigid, binary definitions of dress" in Western society. Over 60 garments are on view, from haute couture to ready-to-wear pieces. Curated by Michelle Tolini Finamore, the exhibition also includes paintings, postcards, photographs and video footage. The show is divided into three sections – Disrupt, Blur and Transcend. Each section features a mix of historical and contemporary pieces, underscoring how gender-bending fashion is not a new phenomena. "Boundary-pushing contemporary designs appear in dialogue with historical garments, exploring moments when people have disrupted, blurred and sought to transcend concepts gendered clothing over the last century," said the Museum of Fine Arts, Boston (MFA) in a project description. The show looks at historical movements such as the garçonne styles of the 1920s, in which womenswear took on a boyish look, and the 1960s peacock revolution, in which the traditional men's suit became more flamboyant. French couture designer Jean Paul Gaultier, Commes des Garçon's Rei Kawakubo and British fashion designer Vivienne Westwood are among well-known contemporary designers represented in the show. Others include Canada's Rad Hourani, who is known for gender neutral designs. The museum's in-house architect, Chelsea Garunay, oversaw the exhibition's design, which makes use of sharp angles, black walls and streaks of colour. 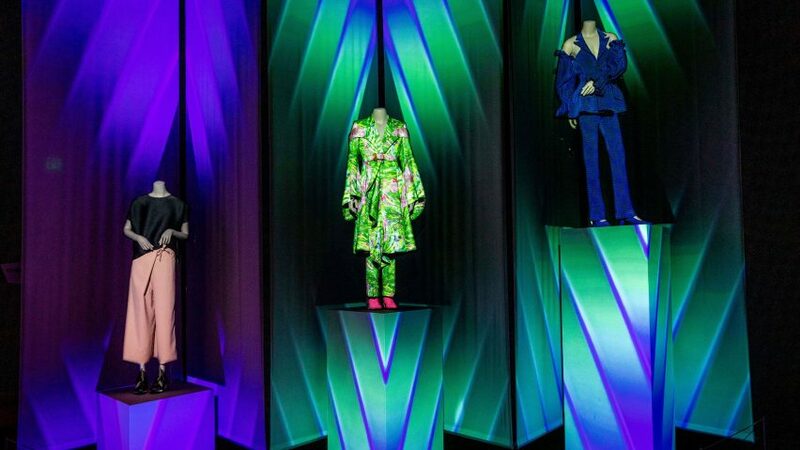 Mannequins donning a range of attire are dispersed throughout the show, with some standing atop pedestals and platforms and others set within prismatic, triangular cutouts. Elements such as coloured acrylic glass and vivid light projections onto fabric curtains give the show a dynamic feel. As visitors move through the galleries, delineated colours and structures begin to break down and merge, just like the blurring of men and women's fashion. The show culminates in a space with flowing patterns and moving light, which are meant to embody "fashion beyond the gender binary". The show, which runs through 25 August, does more than document styles and trends, according to the museum. "The garments on view speak broadly to societal shifts across the past century," the museum said. "Together, they open conversations on changing gender roles, ongoing efforts towards LGBTQIA+ rights and racial equality, the rise of social media as a powerful tool for self-expression, and much more." Other recent fashion exhibitions include The Met's Heavenly Bodies show, which explored ties between fashion and the Catholic church, and a show at San Francisco's de Young Museum that surveyed contemporary Muslim attire, from luxury evening wear to the controversial Nike hijab. Photography is by Michael Blanchard unless stated otherwise.